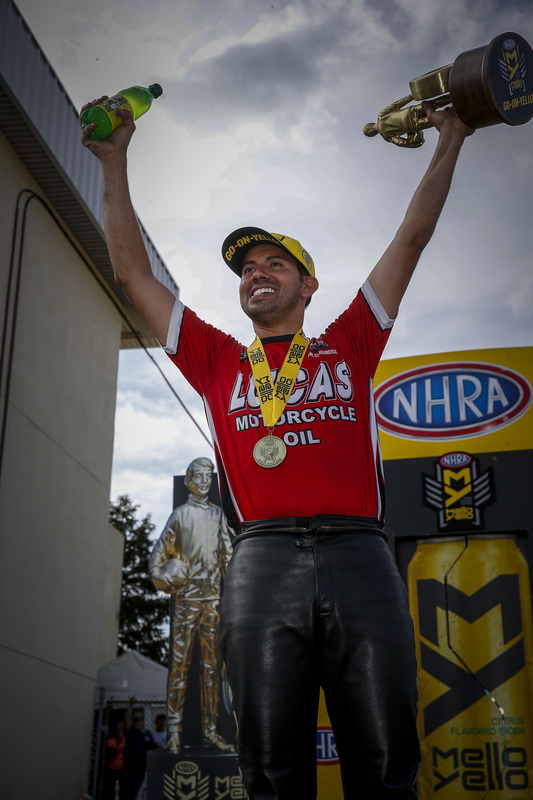 In Pro Stock Motorcycle, Hector Arana Jr. earned his second victory of 2018 and 13th of his career on Sunday at the 34th Dodge NHRA Nationals at Maple Grove Raceway. 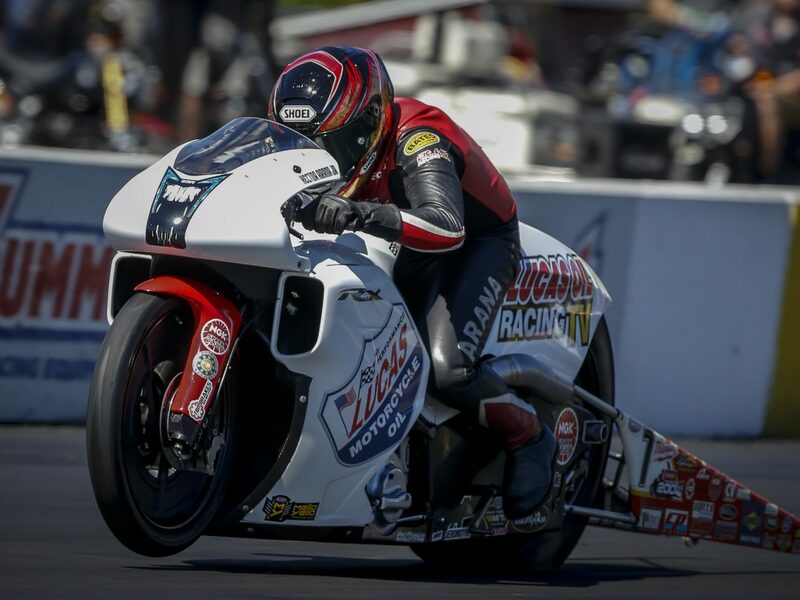 With a run of 6.842 at 197.74 on his Lucas Oil Racing TV EBR in his final-round matchup against No. 1 qualifier Matt Smith, who slowed to a 7.306 at 145.88. Arana Jr. jumped to second in points after his second career win at the track and trails Eddie Krawiec by just three points. 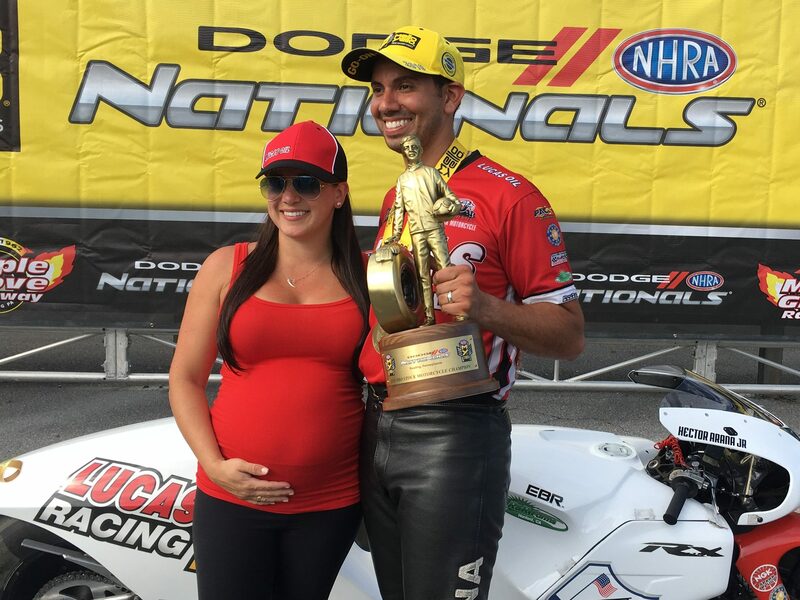 Arana Jr. picked up wins against Ron Tornow, Joey Gladstone and points leader Krawiec en route to the final. Smith’s path to his 47th career final round included victories against John Hall, Steve Johnson and LE Tonglet, as he improved to third in the points standings. 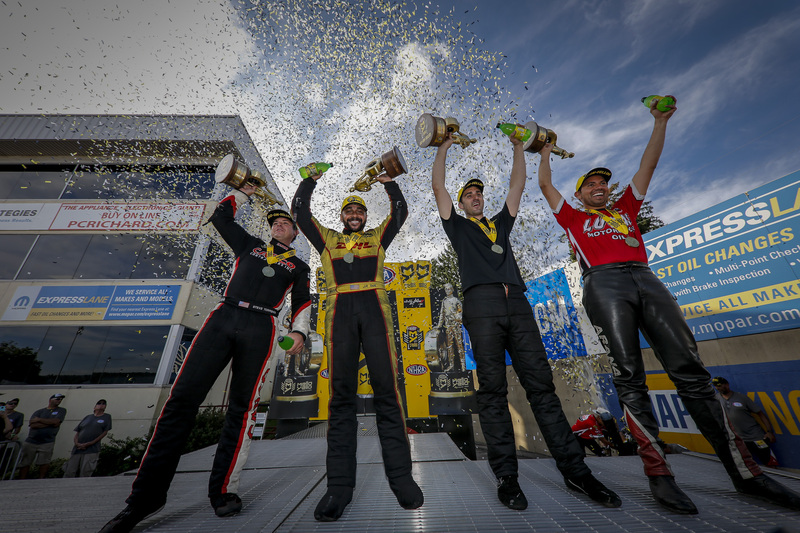 The NHRA Mello Yello Drag Racing Series continues Sept. 21-23 with the second race in the Countdown to the Championship, the AAA Insurance NHRA Midwest Nationals at Gateway Motorsports Park in Madison, Ill.
1. Hector Arana Jr; 2. Matt Smith; 3. LE Tonglet; 4. Eddie Krawiec; 5. Andrew Hines; 6. Steve Johnson; 7. Joey Gladstone; 8. Angie Smith; 9. Scotty Pollacheck; 10. Jerry Savoie; 11. Mark Paquette; 12. Jim Underdahl; 13. Angelle Sampey; 14. Ryan Oehler; 15. John Hall; 16. Ron Tornow. SEMIFINALS — Arana Jr, 6.880, 196.85 def. Krawiec, 6.905, 195.42; M. Smith, 6.814, 197.39 def. FINAL — Arana Jr, 6.842, 197.74 def. M. Smith, 7.306, 145.88. 1. Eddie Krawiec, 2,184; 2. Hector Arana Jr, 2,181; 3. Matt Smith, 2,147; 4. LE Tonglet, 2,144; 5. Andrew Hines, 2,137; 6. Jerry Savoie, 2,082; 7. Steve Johnson, 2,073; 8. (tie) Scotty Pollacheck, 2,062; Angie Smith, 2,062; 10. Angelle Sampey, 2,033.